This week our prompt for the Bible Verse Challenge at Christian Paper Crafts was Nautical. When I think of Nautical, I think of boats, anchors, seashells and lighthouses. 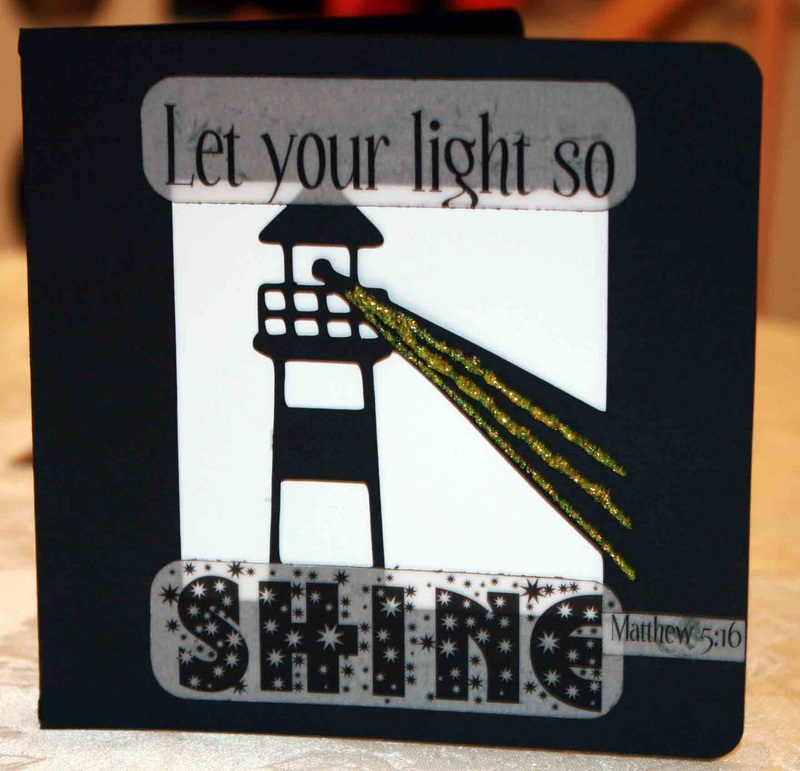 I knew I could make a lighthouse using my Cricut but then I had to think of a scripture from the Bible to tie into the lighthouse. Then I remembered Matthew 5:16... Let your light so shine. Using an 8 1/2x11 sheet of black cardstock and the square card feature on my Life's a Beach Cartridge I cut out this black card with the lighthouse in the window. I backed the window with white cardstock so that the lighthouse would be defined and then added yellow Stickles for the beams of light. The scripture is from a vellum quote pack from Die Cuts with a View. That is a really neat card Jennipher. I'm going to have to try some of those cards on the carts I have. What a great card Jennipher! You're quite talented with the Cricut....very nice work & tfs!!! Yes, yes I love it.